Coconut ladoo recipe made using condensed milk – quick and easy ladoo recipe with only four ingredients. 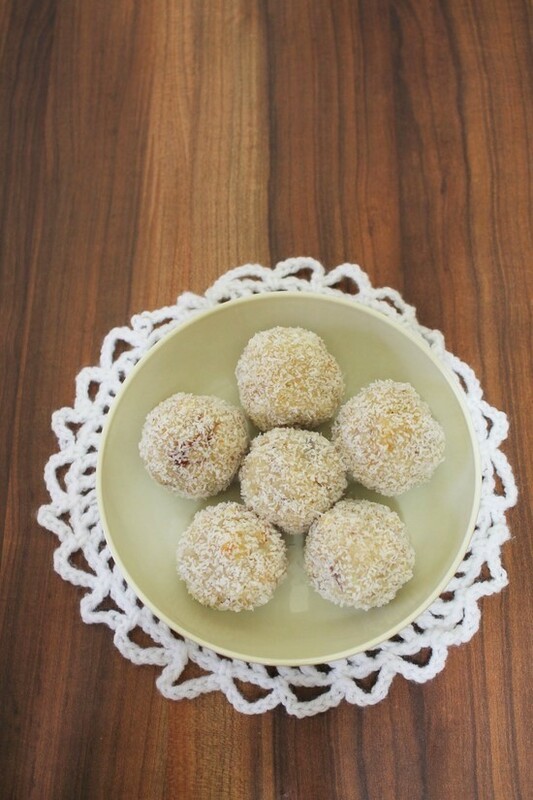 These coconut ladoos are made with very minimal ingredients (Just four ingredients). There are only two main ingredients which are coconut and condensed milk. Rest two ingredients are cardamom powder as a flavoring agent while dried fruits or nuts add some texture to the ladoo. You can use any variety, fresh or frozen or dessicated coconut. Whatever you have available, use that. Here I have used frozen coconut to make ladoo. 1) Take grated coconut in a pan. turn the heat on medium. 2) Roast the coconut for 2-3 minutes with stirring constantly or till the coconut gets heat up and moisture is evaporated. We don’t want to brown them. Here I have used frozen coconut, so it took me 5-6 minutes to get rid of moisture. 4) Mix well and cook on medium-low heat. 5) It starts to bubble up and will get thicken. Do stir frequently. 6) Cook till it starts to leave the sides of the pan. Turn off the stove. 7) Add cardamom powder, chopped cashews and almonds. 9) Remove the mixture to a plate so it will cool down faster. 10) Once it is cooled down completely, take small portion and make tight smooth ball using your hand. If it is sticky then grease the palm with little ghee. 11) Shape all the ladoos. This quantity makes 6 medium sized ladoo. 12) Roll the ladoo in dry desiccated coconut one by one. This step is optional though. Make this ladoo and enjoy with your family or loved ones. 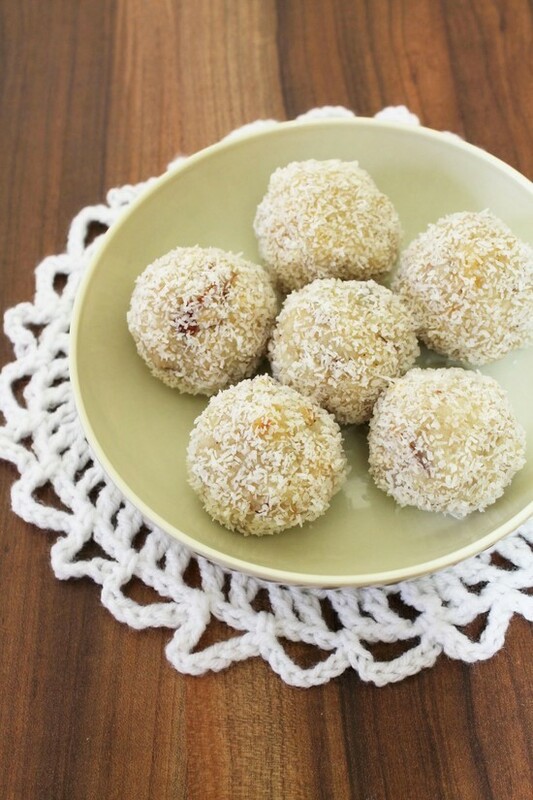 Serving suggestion: Serve coconut ladoo as a dessert or have it any time of the day. I made this ladoo long time back (during Ganesh chaturthi) , but didn’t get the chance to post it. That time I also made another version of coconut ladoo made with khoya. That is also quick to make like today’s recipe. The mentioned quantity of condensed milk gives enough sweetness to the ladoo for me. If you like more sweet then you can add few tablespoons of sugar along with condensed milk. While shaping the ladoo, if the mixture is loose then put it back on stove and cook for few more minutes or till it gets thick. If you don’t like dried fruits in ladoo then you can skip it. Here I have added only cashews and almonds, you can add raisins as well. Take grated coconut in a pan. turn the heat on medium. Roast the coconut for 2-3 minutes with stirring constantly or till the coconut gets heat up and moisture is evaporated. We don’t want to brown them. Add condensed milk. Mix well and cook on medium-low heat. It starts to bubble up and will get thicken. Do stir frequently. Cook till it starts to leave the sides of the pan. Add cardamom powder, chopped cashews and almonds. Mix well. Remove the mixture to a plate so it will cool down faster. Once it is cooled down to touch, take small portion and make smooth ball using your hand. Roll the ladoo in dry desiccated coconut one by one. This step is optional though. What is the shelf life of these laddoos? How limg can they be stored? it stays good for 3-4 days in refrigerator. Can i use desiccated coconut with your condensed milk recipe. 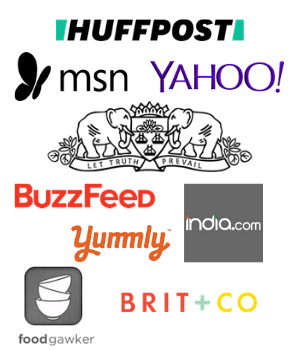 I know you have another recipe where you used khoya. I do not want to use khoya. So want to try this recipe with desiccated coconut. Please let me know as soon possible. Thanks Sakshi for positive review. Good to hear that both came out good. Hope you enjoy other recipes as well.